Running Time: 2 hours and 50 minutes, with a 20 minute interval. Please note Katherine Jenkins is not scheduled to appear on Tuesday 18 April 2017. The appearance of any particular artist cannot be guaranteed, it will be subject to illness and holidays. If in doubt please check before booking. You will receive a confirmation email with an e-ticket attached. Please print this e-ticket and present it to the front of house staff, they will direct you to your pre-purchased seat. You must have a printed copy of the e-ticket along with some photographic ID. We recommend you arrive a minimum of 30 minutes before the performance to settle into your seats. Children under 5 years will not be admitted to the venue. Absolutely amazing! Visually stunning, they did themselves a disservice by classing it as semi-staged. Alfie Boe and Katherine Jenkins were both fantastic and we were so pleased to see the lovely Nicholas Lyndhurst as the Star keeper. The orchestra conducted by the amazing David Charles Abell was completely spine tingling. Could not recommend enough. If you get the chance to see this cast it's an abosolute must! Excellent, I was completely engrossed. This was a wonderful show, beautiful sung, acted and staged. There was nothing in it which disappointed. I have watched the film version a number of times and love it very much, but this stage production revealed the depth and poignancy of the story in new ways. Worth coming from Glasgow to see it. One of the best nights I have ever had at the theatre. I remember when I was growing up discovering the magic of Rodgers & H, and both watching the film, and listened no to the music of Carousel, and I was carried away by the music and story. To see your London production took me back to my early teens, and I could not stop the flow of tears at times. I bought the tickets as a special present for my wife who is 70 this year, as she is a huge fan of Alfie, and we of course love Kathryn. It was worth every penny. I really enjoyed this performance. The singers and orchestra were excellent and the staging imaginative. It was enthusiastically received by a very appreciative audience who at the end gave a standing ovation. This show was pure entertainment and so much better than I had anticipated. It starred two of my favourite singers, and that's all I expected, not a full-blown show. Really, really good, and it would be great if it could continue so more people can see it. Many (most) will not remember the original, so it will seem like a brand new story. I could not fault KatherineJenkins and Alfie Boe who both sang perfectly and acted exceedingly well. The orchestra was also excellent. Very good show. Good story and excellent presentation by all. Fantastic show very sensitively performed hardly a dry eye in the house. Sounds filled the auditorium. Jenkins and Boe were fabulous . Absolutely loved Carousel. We thought Alfie Boe and Katherine Jenkins were amazing but the whole cast were excellent as was the large orchestra. A lovely birthday treat. Fabulous, all the cast were wonderful, especially the dancers,Alfie Boe was extraordinary and Katherine Jenkins was quite endearing as Julie Jordan,to say I laughed and cried in equal measure is to put it mildly, I was in bits. we enjoyed seeing Alfie and Kathrin together but we're disappointed that they never sang, You will never walk alone, as an encore to try and get the audience joining in. Other than that really well acted with so many magnificent voices. "Carousel" is an excellent musical, highly recommended, the music is glorious. Only drawback was the expensive tickets. This was a very good production and I thoroughly enjoyed it. Alfie Boe and Katherine Jenkins were very good as were all the cast. It was a wonderful performance, good choreography with excellent ballet/dance routines. Highlights were definitely "You will never walk alone" and then the end of the first act with Alfie Boe singing "My Boy Bill" and ending with "or die" which brought the tears down jus before the interval. The final sequence with Nicholas Lyndhust and Katherine Jenkins was lovely. Lyndhust as the Star Priest in heaven was a lovely touch and was met with roars of laughter when he appeared. A great evening. It is a long time since I last saw a performance of Carousel - the latest London production was superb. Beautiful music and songs stand the test of time. The whole cast were excellent - wonderful performance. A delightful evening. I was not disappointed. The performance met all my expectations. Impressed with scenes, balletic dance and of course, singing. AMAZING! cried last night as i do whenever i watch my dvd i have loved this musical since i saw it with my late mother many years ago as a teenager with gordon mcrae and shirley jones so to see alfie boe and katherine jenkins was amazing i will never forget the amazing performances from them also credit to all who took part many thanks to them all. A wonderful production from English National Opera with Great song and dance sequences. Amazing voice of Katherine Jenkins & Alfie Boe captured out attention .ENO's world-class ,superb orchestra conducted by David Charles Abell was magnificent. The entire cast were memorable. I have seen many musicals over my life but carousel has to be at the top. The venue was beautiful. The orchestra unbelievable and of course the cast amazing. Always been one of my favourite films so the stage production had a lot to live up to. A wonderful evening leaving me very emotional in a good way. What a night - Carousel at its best! Excellent production - Alfie Boe was superb, Katherine Jenkins charming - loved the thought that had gone in to the Overture and the dancing was creative. Orchestra fantastic - a memorable night out! A brilliant combination of the talents of Alfie Boe and Katherine Jenkins made for a superb evening. As Billy Bigelow, Alfie delivered at every level but particularly in the strength of his voice in 'Soliloquy and ' If I loved you.' Equally Katherine's poignant rendition of What's the use of wondering' moved me to tears. Brenda Edward's gutsy performance of 'You'll never walk alone' was also most impressive. The brilliant 42 piece orchestra completed the bliss of revisiting Rodgers and Hammerstein's best musical. Loved it. We had excellent seats and the orchestra were amazing BUT the show was flat. Katherine who is outstanding didn't seem to be enjoying the performance and the chemistry between her and Alfie was non-existent. The tickets were the best on offer and twice the price of most London shows. We left at the interval as it was unbelievably disappointing. Good all round entertainment. The sets and performers were great. Kathryn and Alfie were the real stars of the show. well worth going to see. We enjoyed Carousel immensely but went to watch the show especially to see Alfie Boe. We were not disappointed, his performance was awesome. This was one of the best west end shows that I have ever seen! Beautiful theatre & an amazing cast and crew! Amazing singing, acting, costumes & set design! Loved Loved Loved it all from beginning to end! Added bonus of meeting Katherine Jenkins, Alfie Boe & Nicholas Lyndhurst at the stage door! AB FAB!!! A brilliant production. Katherine Jenkins and Alfie Boe were excellent. The cameo role of Nicholas Lyndhurst was very entertaining. The whole cast showed so much energy and enthusiasm. They were ALL great singers and dancers. A full orchestra was a very welcome addition to the show, producing such a rich and full sound. Katherine, Alfie and Nicholas were all very happy to meet the audience afterwards too. Well done and thank you to everyone involved. We thoroughly enjoyed the show. The Actors were wonderful and the Theatre is beautiful. Wonderful cast in an iconic show. Production really imaginative, brilliant dance routines and well stage managed. Alfie Boe and Kathryn Jenkins superb, what a treat to have them together on the same stage. A must see show. Alfie Boe is outstanding and all the cast are faultless. The only downside is the seats were not comfortable as someone else has said. Carousel . in the safe hands of Katherine Jenkins & Alfie Bowe Carousel .In the safe hands of Katherine Jenkins & Alfie Bowe . Having been enthralled by the original Rogers & Hammerstein's film with Shirley Jones & Gordon Macrae I was somewhat apprehensive that this staged production might spoil my memories of it . It did not . Katherine Jenkins along with Alfie Bowe were equally enthralling as were the rest of the cast . The scenery of the carousel , the clambake, the starkeepers scenes were beautifully created in a simplistic yet effective way and the whole production was wonderful , thank you all . 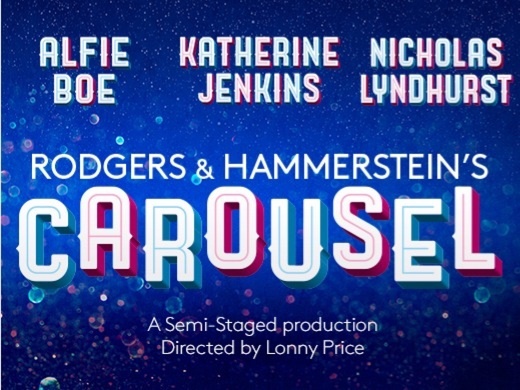 Carousel rightly has a place amongst the all-time great musicals, with an interesting story and some lovely music, but the main reason my wife and I came to the show was to see/hear Katherine Jenkins and, to a lesser extent, Alfie Boe. This is where the slight disappointment kicks in as we heard far less of Jenkins than we were expecting. Beautiful voice yes, but too little of it. On the plus side the staging was more grand than the quoted semi-staged and the cast was large and of overall high quality. The show deserves four stars. A wonderful show thoroughly enjoyed by myself, my daughter and granddaughter. The performance of all the cast was magnificent with the singing of the very highest standard. I was amazed at the opening introduction, which enabled every performer to appear in a variety of different guises, probably the best I have ever seen; and clearly a forerunner to the entire superb performance of the rest of the show. I would especially mention the orchestra, which again was just superb; as was the theatre, my first visit to the London Coliseum, which was a very good venue. A beautiful production, The orchestra was a absolute delight throughout. Just one critism though, I would like to have heard Katherine Jenkins sing more than she did. Fab u lous!!! Thought Alfie Boe stole the show along with mr and mrs snow!!! "The singing and music is fantastic"
"Jenkins has it all . . . the looks, the voice and yes, she can act"
"it is an absolute treat to listen to her [Katherine Jenkins] sing these songs"